The popularity and success of Oncotarget has prompted us to launch the Chromosome section. The Chromosome section publishes high-impact papers of outstanding significance and novelty in all areas of basic research (mostly unrelated to cancer research) and covers a variety of topics, including mitosis and cytokinesis; meiosis and recombination; genome engineering; cell cycle and checkpoint controls; comparative genomics; transcription; chromosome topology, cohesion, repair and replication; heredity and complex traits; epigenomics; computational and modeling approaches; genome stability; aneuploidy; and apoptosis. Submission is centralized via the Oncotarget submission system. Please choose the Chromosome section to direct your manuscript to the Section Editor. Instructions to authors are common for all sections of Oncotarget. 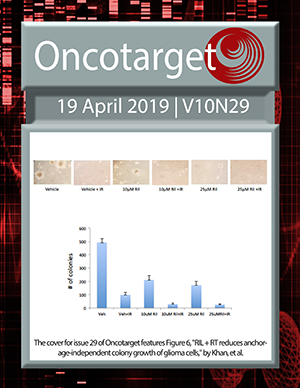 Your paper will be published in Oncotarget within the Chromosome section. Papers rejected by leading journals can be submitted with the original reviews and rebuttal. Papers may also be communicated by members of the Section Editorial/Advisory Board.